Oxidative disinfectants share the property of acting on microbes by oxidising their proteins and cells. This aggressive chemical reaction ‘burns up’ and dismembers the very structure of the molecule which is oxidised, thus very effectively destroying target pathogens. (Non-oxidising disinfectants disable pathogens in other ways by modifying their structure but not necessarily completely destroying it). Common oxidative disinfectants include peroxides, peroxygen-persulfate types, Halamid®, peroxide-peracetic acid, and chlorine based disinfectants. 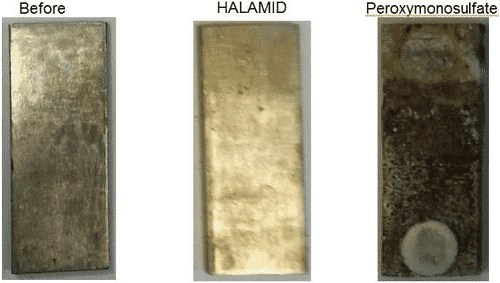 While they all share the same mechanism of oxidation, they may differ largely in terms of performance. 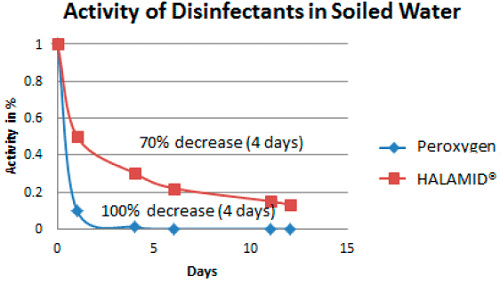 This article will show different behaviours of oxidative disinfectants in corrosivity and efficacy under soiled conditions.